These two had the most beautiful April wedding at Langtree Plantation! From the moment we first met, Kim and Brian were simply a delight to work with! These two busy corporate execs and I worked together for a full year to get all their wedding details just right! Kim was stunning in her all lace gown with champagne belt. She was a classic and timeless bride, joined by her sister and best friend as bridesmaids. The bridesmaids wore navy, complimented by the light gray suits and navy ties worn by the groomsmen. The flowers featured brightly colored corals and greens, a perfect Spring color palette. 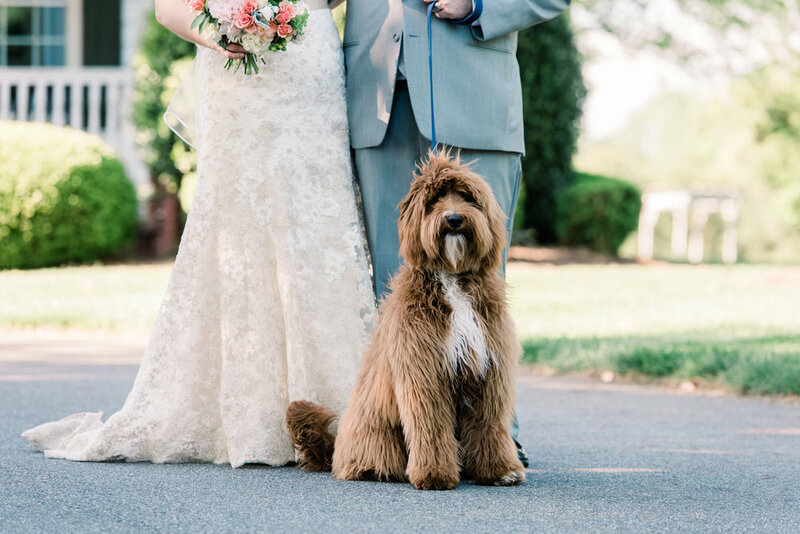 Kim and Brian's sweet goldendoodle, Brady, even made an appearance as a special bridal party member! The ceremony was held in the rustic Langtree barn, followed by the reception in the pavillion. Guests were treated to a Southern-style menu featuring Carolina BBQ and sweet cornbread. Kim and Brian chose a non-traditional bundt cake surrounded by tiny bundts in assorted flavors as their wedding cake for guests to enjoy. They were a huge hit! The celebration continued into the night with lots of dancing and yard games for guests to play. Kim and Brian were beaming as they departed to the cheers of their family and friends! Cheers to the happy couple!!! I cannot wait to see their story unfold as husband and wife!